* or $1000 for just the photography 5 hours total includes before and after wedding photos plus starred items below. Full payment due 2 weeks before wedding date. Engagement Photoshoot must be done before the wedding. This helps photographer get aquainted with wedding couple and is a free service with the wedding package. specialty texture or coating, or desigener envelopes will have additional costs. *5 hours pre-wedding, wedding, indoor and outdoor photo sessions if requested. We set up a backdrop, professional studio lighting both in a seperate room and in the church alter. *Professional Lights brought in - 1 hour set up time before photo sessions begin during which getting ready photos can be taken if at same location as setup. 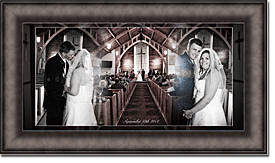 *Digital Photo Editing - 5 hour Softening, Enhancing and Creative Design on select photos. *Photos Uploaded where prints, canvas prints or a vast array of different items can be easily purchased online at reasonable prices. *Images: After a minimum print order or combination order of $150, you are able to have the photographers choice favorite copyrighted photos free of charge for displaying on facebook, or keepsake. *DOWNLOAD/CD: your copyrighted (small watermark) photos will be able to be downloaded for free, or put on a CD for $75, with names and date imprinted on disk that you can keep as a keepsake, they are copyrighted and can not be printed, nor the CD duplicated. Not available until a total of $150 in print orders is received. copyright release? You can download all your images immediately with a copyright release for $250 through the website where you order your photos. But keep in mind our prints are reasonably priced, we do prefer you have your prints done through us so we can best assist and know they are quality prints. use of images: Also you can use the images in other projects if you place in small print (photography by: TracieGrant.com). But please ask permission before doing so. You can also download copyright free images from the website for a fee. PRINTS: Get a Coupon Code for $50 in Prints when you order online. If hotel is needed, we do request a hotel room be provided. or additional $75 fee applies. Reception and dance additional $100 each additional hour. Absolutely gorgeous textured finish in satin or metallic. Mutiple frames available from black, white, cherry, iron. $75 Custom Invitation Design + printing costs. or you pick up at the studio. Book is designed using photographers choice of photos, and then reviewed for a set of revisions by wedding couple. Up to 2 hours in revision editing but must be submitted at one time. Book is designed within 2 weeks of the wedding, and you have 1 week to submit revisions. This enables us to get your book shipped of to you in a timely matter. You can order prints individually or save by ordering in packages. Packages are only available for online orders. $250 Custom Wedding Website Stays live for 1 Year without any fees. Designed using your Engagement shoot photos. Includes your own email address, www.domainname.com.. Also includes online RSVP's and make address labels. DVD Slideshow: High Resolution for play back in HD, to music of your choice, DVD slideshow of the top 100-150 photos as a keepsake, playable on TV in HD for $150.